How do you allocate resources for Quality and Safety? How can you build the case for more resources? 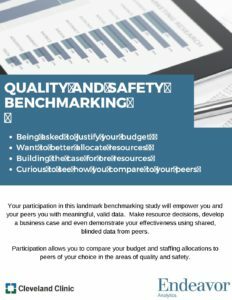 This landmark benchmarking study, brought to you by Cleveland Clinic and Endeavor Management (formerly Gelb Consulting), will empower you and your peers with meaningful, valid data. Participate in the areas of your choice, including quality and safety.